The Adventure Tourism Development Index is a ranking of adventure tourism potential for countries around the world based on principles of sustainable adventure tourism. The ATDI's 10 Pillars of Adventure Market Competitiveness are principles of market development that drive benefit to communities, celebrate culture and protect the environment. Countries are ranked in each of the 10 Pillars of Adventure Market Competitiveness and the results compiled annually into a report. The report offers practical information for global tour operators about country/regional resources attractive for adventure tour development. It also provides detailed analysis and scores useful for monitoring adventure market development goals year to year. Click here to learn more about the 10 pillars and to see rankings from past years. Government policies which support and foster sustainable and rural tourism development are crucial to adventure tourism market competitiveness because they safeguard the destination's natural, heritage and cultural resources and provide a positive investment climate for the private sector. When public and private sector actions are coordinated, the private sector flourishes, attracting investment and development to a region. Examine qualitatively whether adventure operators provide for the safety of travelers, and also whether facilities exist to cope with travel-related injuries. For example, in destinations where scuba diving is a popular draw, do hyperbaric chamber facilities for decompression exist? In destinations where mountaineering is prevalent, are rescue operations available? Do guides have first aid training? Generally, does the client safety offered meet internationally accepted standards? Adventure travelers want untrammeled and well-managed natural resources. Destinations with unusual or rare natural resources, which are well-managed and not exploited, will earn high praise from adventure travelers and sustained market competitiveness. A healthy local population is more likely to be able to foster and nurture new businesses, and to care for its resources responsibly. 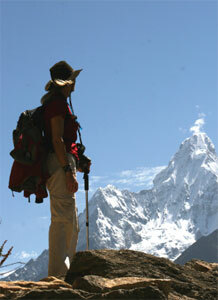 Countries where healthcare is readily available are better able to support adventure travelers. Adventure sports span a range of outdoor nature-based activities - from bird watching to mountaineering; whitewater rafting to rock climbing; caving to paragliding. Destinations with resources lending themselves to a the development of a particular sport, for example cliffs excellent for ice climbing, or forests with a wealth of bird species, may find themselves with a market opportunity and sustained competitive advantage. An adventure market's vitality and strength originates from the so-called "fringe" - those pioneering businesses with unusual offerings that would seem to appeal only to a small subset of niche enthusiasts. Activities which begin outside the mainstream, or which seem too eccentric to appeal to a broader adventure travel market, reliably seem to end up as mainstream activities: the surging popularity of snowboarding is a case in point. Given this reality, destinations in which entrepreneurship in the business sector is thriving more likely to become competitive in the adventure travel market. The Humanitarian Pillar is concerned with human development in a country - the presence of basic services such as sanitation for example, and with the potential for blended adventure and volunteering trips. The trend toward volunteer tourism and its appeal to adventure travelers will continue to build; find destinations in which volunteering is available will be competitive. Adventure travelers, unlike mainstream package tourists, are frequently less sensitive to deficiencies in hard infrastructure, but perhaps more sensitive than other travelers when it comes to conservation and soft tourism infrastructure. While hard infrastructure may take substantial capital investment and years to develop, sometimes the soft infrastructure required by adventure travelers can be developed with comparatively little capital outlay. Adventure travelers are as keen to learn about new cultures as they are to explore nature. For the adventure traveler, being able to experience local culture in an authentic way is a sought-after outcome of the travel investment. Destinations which encourage local people to preserve their culture - even as modern influences continue to shape and evolve local customs - fare well with adventure travelers. Our method does not encourage local people to become living museums to the past or actors staging outdated customs, but to acknowledge and honor their customs, recognizing their unique contribution to the world stage. A destination's image can be one of the most malleable aspects of market competitiveness. Image is also important in guiding and influencing sustainable market development. A destination's image for sustainability and adventure opportunity will attract travelers who value these aspects. Through their visitation and expenditures, these people will in turn further support the country's ongoing sustainable.